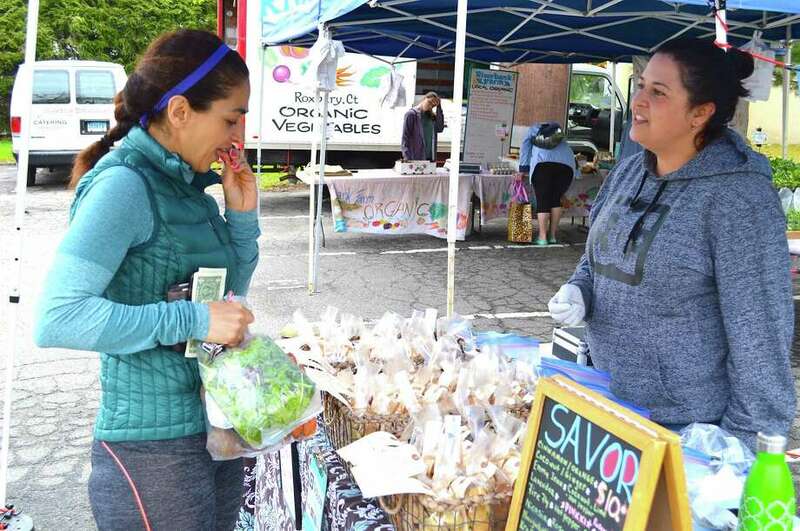 At the opening day of the Farmer's Market, Ladan Tavasoli of New Canaan samples one of Jodi Bulvanoski's cookies from the Thomaston-based at Savor the Difference. NEW CANAAN — For the many participants who helped celebrate Earth Day on Saturday, it was simply a matter of doing what’s right for the kids. “We’re only going to be here a little while, but for our kids,” she said, it’s important to do what’s right for the planet they will inherit. Conscious consumerism is the one of the themes for the market itself, which began its 17th season in beautiful weather, with a steady crowd in attendance. “We run through December, rain or shine,” said Lexi Gazy, market master, who was offering little kids the chance to plant some peas to help celebrate Earth Day. Gazy pointed over to one of the many children visiting at the market. Activities included various cleanup projects around the areas, planting activities and simple celebrations of the planet we cherish. “I think it’s fantastic,” said Laura Miller, librarian at the New Canaan Library, where several activities took place, including plantings of baby trees, for Earth Day. “I think it’s a great way for kids and adults to connect to nature and really be mindful of what’s happening,” she said. “After all these years it seems like it’s something people are still paying attention to,” said Mark Nicyper, a vendor from Whistle Stop Bakery in Ridgefield, who was pleased to see so many children at the Farmers Market.